No matter the context—boom, internet or videogame hedgehog—when the word "sonic" comes up, people think of speed. 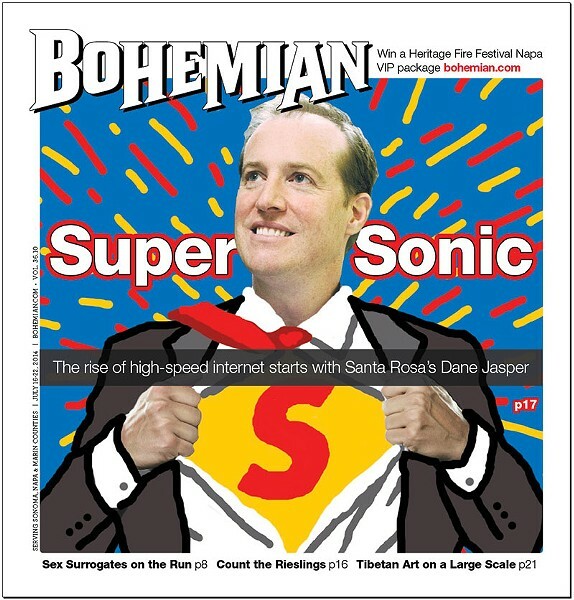 As for Sonic.net, the Santa Rosa–based internet provider, its growth hasn't been as fast as others, but it's picking up steam 20 years after its founding. Sonic is the first company to offer residential gigabit fiber internet service in California and is expanding into areas outside the North Bay. It survived the dotcom bust of 2001 and has made a name for itself as a champion of internet privacy. Not bad for a company founded by a guy who didn't finish high school. It's hard to find an internet company that's been around as long as Sonic. Dane Jasper and Scott Doty started Sonoma Interconnect, which was later shortened to Sonic, as Santa Rosa Junior College student employees in 1994. The company celebrates its 20th birthday this month. For perspective, how about a timeline: earlier in 1994 Yahoo! had just launched; AOL would come online the following year; Google was four years away from existence; the iMac (1998) wasn't even a gleam in Steve Jobs' eye; Napster and the debate of internet piracy was still five years away; Facebook friends had to wait 10 years before they could be approved; and the ubiquitous video site Youtube was still 11 years prenatal. Sonic found a market before there was a market, banking on the global shift that the internet would bring and getting in on the ground floor on their own terms. 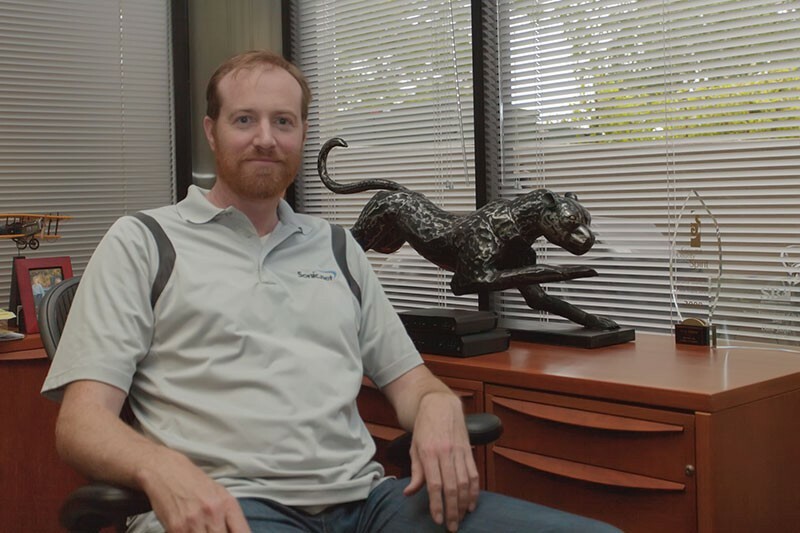 NOTHING BUT NET Dane Jasper founded Sonic back in the internet’s infancy and today the Santa Rosa company gives larger providers like Comcast a run for their money. Jasper was 21 when he cofounded Sonic. He and Doty were in the SRJC's burgeoning computer department, "doing things like hooking up a computer lab to the campus network, loading drivers on staff machines so they could connect," says Jasper. Santa Rosa was also the first community college in the state to offer internet access to students. But even then, internet trolls and identity thieves popped up now and again. "One of the customers was acting rudely" in a chat room, says Jasper, and was cursing at people through text on the screen. "Back then, I guess that was grounds for calling the school hosting the student," he says with a smile, "back when the internet was a friendlier place." This particular customer didn't seem the type who would act in this manner. It was discovered he was really a male high school student. "Through that we learned that accounts had been sold on the black market, so to speak—sort of a primitive identity theft." says Jasper. "That was really what made me realize there was a commercial interest in internet access." At age 16, Jasper was done with high school. "You could take a test for a certificate of high school proficiency," Jasper says, "so I didn't graduate. Then I went and worked." He took retail jobs not unfamiliar to teenagers, at places like RadioShack, Domino's and Software Etc., all the while maintaining his interest in computers and bulletin board systems (BBS), a kind of primitive internet network popular in the early '90s. "When I was a kid, I had run bulletin board systems. Then when I was 17, I got a job working for a guy who had an eight-line BBS," says Jasper. When he was 18, Jasper got a job helping students in SRJC's computer lab before moving on to installation, mainframe and networking projects.